Researchers in the areas of regenerative medicine, basic biomedical research, and drug discovery all share a common need for reproducible procedures to culture human pluripotent stem cells (hPSCs) and/or differentiated cells. Some of the technical steps involved in this include derivation of new human embryonic and induced pluripotent stem (iPS) cell lines, expansion to large quantities, differentiation to appropriate cell types, and finally maintaining the differentiated cells in their matured state. All these steps must comply with clinical requirements. Many researchers still believe there are major challenges involved in almost all above mentioned steps. Derivation of stem cells in a clinically relevant manner has been difficult if not impossible. Expansion of stem cells has resulted in karyotypic changes or unwanted differentiation. Directed differentiation has been challenging with more than 50,000 researchers searching for answers. When mature cells are placed in vitro for culture, they often de-differentiate within hours to days into other cell types, such as fibroblasts. In this article I will discuss the use of biologically relevant human recombinant laminins from BioLamina that successfully recreate specific cell niches in the cell culture dish. 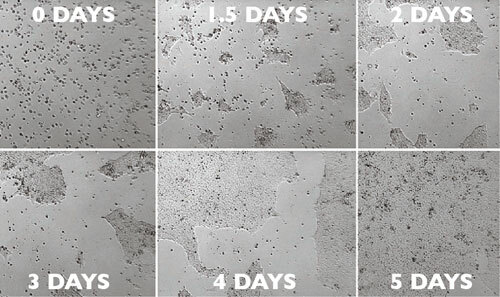 This enables robust cell cultivation in highly physiological microenvironments that practically solves all current technical challenges with stem cell culture. Almost all cells of the body grow on specialized extracellular matrices (ECMs) called basement membranes where they bind via cell-surface receptors such as integrins to specific laminins. 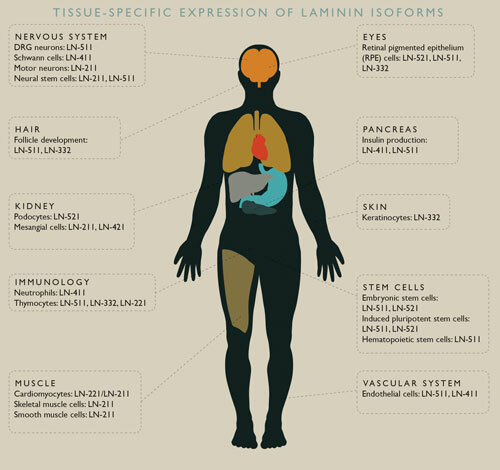 Laminins exist in at least 16 different isoforms and are large heterotrimeric proteins that have pivotal roles for cell-anchorage, proliferation, differentiation, and inhibition of apoptosis. Due to the complex nature of the laminin molecules with multifunctional domains and binding sites they have been virtually impossible to purify with their functions intact. It is only in the past few years that specific laminins have been produced as full-length recombinant proteins with their biological activities intact, which is crucial for their proper support of different cell types. Laminins are the main cell-type specific proteins of the ECM and are both spatially and temporally regulated (Figure 1). For instance, laminin-211 (LN-211) is expressed in heart muscle to support cardiomyocytes via the basement membrane of the endo/pericardium and capillaries. In the pancreas, LN-511 and LN-411 are expressed in endothelial cells that are crucial for the insulin production and proliferation of beta cells. In the same manner, specific laminins provide key cellular signals for different cells of the nervous system, liver, kidney, skin, and other vital organs. In the early embryo, LN-521 and LN-511 are the first ECM molecules to appear, already at the four-cell stage. These embryonic laminins are expressed and secreted by individual pluripotent stem cells and surround human ES cells in the inner cell mass (Figure 2), whereas another isoform called laminin-111 is instead found in the Reichert’s membrane. LN-521/511 and LN-111 therefore have completely opposite roles for pluripotent stem cells, where the first are crucial for sustained cell-survival and self-renewal of stem cells while LN-111 actually initiates differentiation. It has also been shown that the mechanism that underlies the functionality of feeder cells to support hPSCs is their secretion of LN-511. Figure 2. 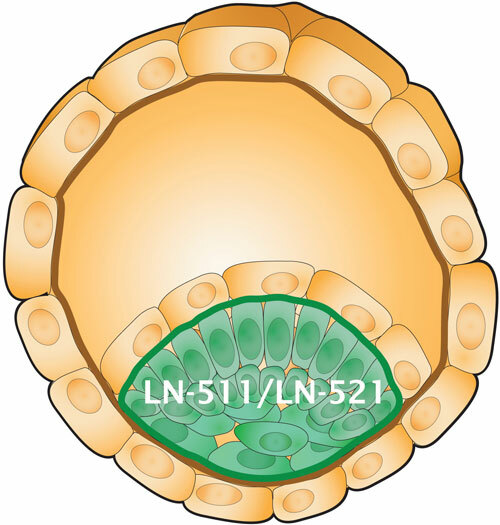 Schematic picture of the blastocyst where stem cells secrete and grow on laminin-521 and laminin-511 in the inner cell mass. Recombinant LN-521 and LN-511 provide the proof-of-principle that biorelevant laminins are sufficient and necessary for physiological cultivation at an industrial scale of hES and iPS cells in a completely chemically defined and xeno-free environment. The specific laminin-integrin binding initiates rapid migration and monolayer growth of homogenous pluripotent cells with efficient self-renewal (Figure 3). The natural biological signaling pathways that are activated in hPSCs through this mechanism demonstrates that no artificial inhibitors such as ROCK or LIF are needed for high cell survival and pluripotency. The growth-factor-like properties of the laminin-521 matrix enables single-cell suspension passaging that drastically facilitates subculturing. This allows for robust, easy, and automated procedures to quickly reach industrial quantities of cells that expand 10-fold within four days. This clinically relevant cell culture system thus reduces the time and labor needed for expansion and the improved biological relevance likely also increases the quality of data by stabilizing the cellular phenotype. Embryonic laminins can also be used for derivation of new human embryonic stem cell lines at high efficiency, even from single cells of individual blastocysts in a feeder- and xeno-free environment. Removing individual cells from a blastocyst is a standard procedure in IVF clinics and enables ES cell-line generation without destruction of the embryo. Together the results show that laminins are the key cell niche molecules to successfully mimic the in vivo microenvironment in vitro. Figure 3. Human ES cells passaged in single-cell suspension grow rapidly as monolayers on laminin-521 without the use of any artificial inhibitors, such as ROCK. Expanding primary cells in culture is a significant challenge for many types of cells, and differentiated cells often de-differentiate quickly when kept in vitro. For example, although pancreatic beta cells can be kept in culture and produce insulin, they have been practically impossible to expand. However, if one isolates pancreatic islets and cultures them on their specific in vivo laminins they flatten out, produce insulin, and even start to proliferate and expand. Similarly, cardiac progenitor cells can be easily expanded and turned into mature cardiomyocytes simply by changing the laminin matrix they grow on, demonstrating the enormous effects laminins have on the function and behavior of cells. Other cell types that are now successfully generated and expanded on specific laminins include RPE-cells, endothelial cells, and neurons. To conclude, by providing cells their biorelevant matrix proteins, the natural intracellular interactions needed for cell adhesion, proliferation, and survival are initiated. Expansion of hPSCs on recombinant laminin-521 in a xeno-free environment is simple to use and can provide a bridge for the gap between academic stem cell research and development of human cell therapy. The availability from BioLamina of many of the currently known laminin isoforms as recombinant full-length proteins with intact biological functions allows researchers to screen specific isoforms for their particular cell of interest. This enables new mechanistic studies and importantly also makes it possible to keep cells mature for a significantly longer time in culture than has previously been feasible. Taken together, recombinant laminins enable robust derivation, expansion, and differentiation of cells in physiological microenvironments suitable for regenerative medicine and drug discovery. Karl Tryggvason, M.D., Ph.D. (karl@tryggvason.com), is the scientific founder of BioLamina and a professor at the Karolinska Institute and Duke-NUS.